Which illness exists at my finger? My fingernail changed since existence of the cyst. Exists a connection between the cyst and the deformed fingernail? Some months ago an oval swelling of approx. 8 mm in diameter developed at my finger close at the joint nearest the fingernail. The change is represented in accompanying illustration. 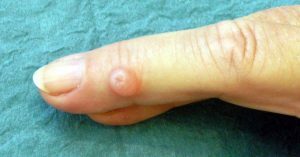 Digital mucous cysts are usually small oval fluid-filled sacs, that form on fingers and rarely at the toes. The mucous cyst is a type of a ganglion. Most mucous cysts appear between the last fingerjoint and the fingernail. Yes! Typically mucous cyst are not symptomatic. If the digital mucous cyst ist located near the nail plate, longitudinal grooving of the nail is a common problem caused by mucous cyst. In some cases, grooving ot the nail may precede the clinical manifestation of the mucous cyst by months. Why do I have a finger cyst? Mucous finger cysts often found in patients with osteoarthritis of the last finger joint. The joint near the end of the finger calls in the medicine DIP – joint. Together with the osteoarthritis we often see Heberden’s node at the last joint of the finger. Physicians do not know accurately, why a finger cyst develops. One theory suggests, that cysts result from a damage of the joint capsule. In osteoarthritis the joint capsule damage can be caused by small bone tabs (Bone edges, bony spurs), often found in osteoarthritis. In such a case, fluid move from the last joint of the finger into the mucous cyst. Synovial fluid is translucent. Therefore most mucous cysts look clear or flesh-colored. Which symptoms cause finger cysts? Digital mucous cysts are often asymptomatic. But some patients feel pain in the cyst (or in the neighbouring finger joint). Larger cysts can press on neighbouring small finger nerves. Patients with larger cysts experience tenderness and a decreased range of motion at the joint nearby the cyst. If the mucous cyst is located near the fingernail, patients often notice a groove in the fingernail just above the mucous cyst. This nail ridging is caused by pressure on the nail matrix. Patients with lager cysts also complain about a disfiguring appearance. if a mucous cyste bursts, usually a gelatinious fluid empties. Patients then often report on an improvement of the complaints.